(CBS/AP) BLACKSBURG, Va. - It was a day of high anxiety on the campus of Virginia Tech University, which was on lock down for approximately five hours Thursday after three teenagers attending a summer camp said they saw a man holding what looked like a gun. The university issued an alert on its website at 9:37 a.m. telling students and employees to stay inside and lock their doors, on the campus where a 2007 massacre left 33 people dead in one of the nation's deadliest mass shootings. Text and phone messages were sent to more than 45,000 subscribers to the school's alert system, along with an email sent to the entire campus, said school spokesman Mark Owczarski. The school's outdoor sirens also sounded, he said. The campus-wide alert was later lifted and students and staff were told to resume their normal activities, according to an email sent at 2:42 p.m. The email said there would be a large police presence on campus throughout the day. Classes were canceled for the day. Police had received no other reports nor found anyone fitting the description the children gave. A composite sketch was posted on the school's website, and officers had scoured the campus for any sign of the possible gunman. Several thousand students attending summer classes, as well as the school's 6,500 employees, were on campus when the alert was issued, said University spokesman Larry Hincker. Many of the school's 30,000 students are on summer break and will return for the fall semester that begins Aug. 22. Maddie Potter, a 19-year-old rising sophomore from Virginia Beach, said she was working on a class project inside Burchard Hall when a friend received a text message from the school at 9:41 a.m. Soon after, staff locked the doors and turned off the lights. Potter, an interior design major, said she was still holed up in a wood shop inside the building Thursday afternoon. She said things had calmed down since the alert went out. "I was pretty anxious. We had family friends who were up here when the shooting took place in 2007, so it was kind of surreal," she said. "I had my phone with me and I called both my parents." The campers had told police they saw the man quickly walking toward the volleyball courts, carrying what might have been a handgun covered by some type of cloth. The children who made the report were visiting the campus as part of a summer academic program for middle schoolers in Washington, Richard Tagle, CEO of the group Higher Achievement, said in an emailed statement. All the students who were with the group are safe, he said. "We're in a new era. Obviously this campus experienced something pretty terrible four years ago ... regardless of what your intuition and your experience as a public safety officer tells you, you are really forced to issue an alert, and that's where we believe we are right now," Hincker said during a morning news conference. 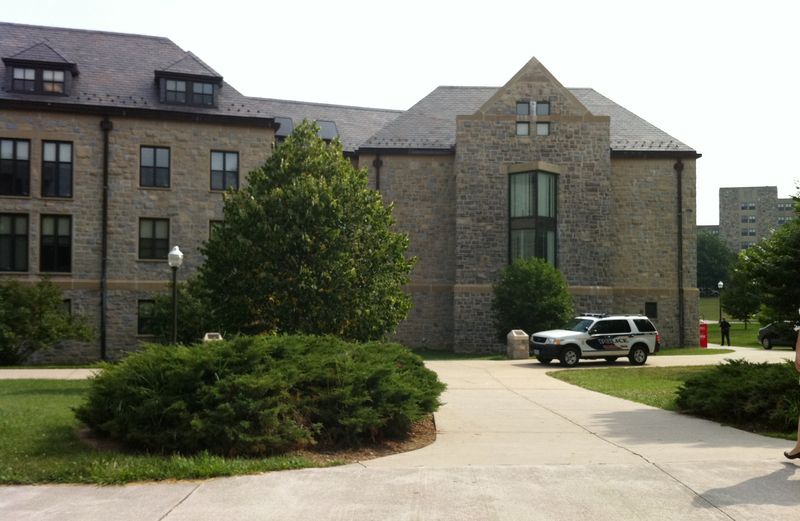 S. Daniel Carter, director of public policy for Security On Campus, a nonprofit organization that monitors how colleges react to emergencies, said it appeared Virginia Tech responded appropriately. "You have to take all of the reports seriously because you cannot take the risk that there's something serious going on and you failed to act," Carter said. "The key is the community was informed so they were able to take steps to protect themselves." Carter said having various forms of notification - sirens and message boards in addition to text messages and e-mails - are important in instances like Thursday's, when many on campus are there for summer camps or otherwise not registered to receive alerts individually. Virginia Secretary of Public Safety Marla Decker said she was glad the children reported what they saw. "We'd rather have a report come to us, investigate it and later in the day say there was nothing to it," she said.